​Tim is the founder and owner of O'Neill's Fly Fishing as well as the owner of the Norvise fly tying system. He began fly fishing at the age of 10. During the following 3+ decades, his passion for the sport carried him through many parts of the industry including; retail sales, commercial fly tying, lecturing, seminar teaching, and guiding. Tim’s fly fishing exploits have been written up in publications like “Out and About Delaware” and “Delaware Today” as well as being interviewed for NPR radio to discuss fly fishing. A Master Machinist, Tim has been manufacturing parts for the Norvise for well over a decade. His personal and professional relationship with Norm Norlander made Norm's choice to pick Tim as his successor a sound one. He considers himself an educator first and gets the most pleasure in helping others learn more about this great sport. Ed Has been with us since the very beginning of this journey in the fly fishing industry. One of the most accomplished fishermen I have ever fished with, to out fish Ed on a outing or a trip doesn't happen often, and when it does you can bet you have had a great day! Preferring warm water species, Ed is a self proclaimed Smallmouth addict, and he has the fly patterns to back that up. Check out his Facebook or Instagram below and you will seen see what we are talking about. He is truly a master on the water and at the vise! 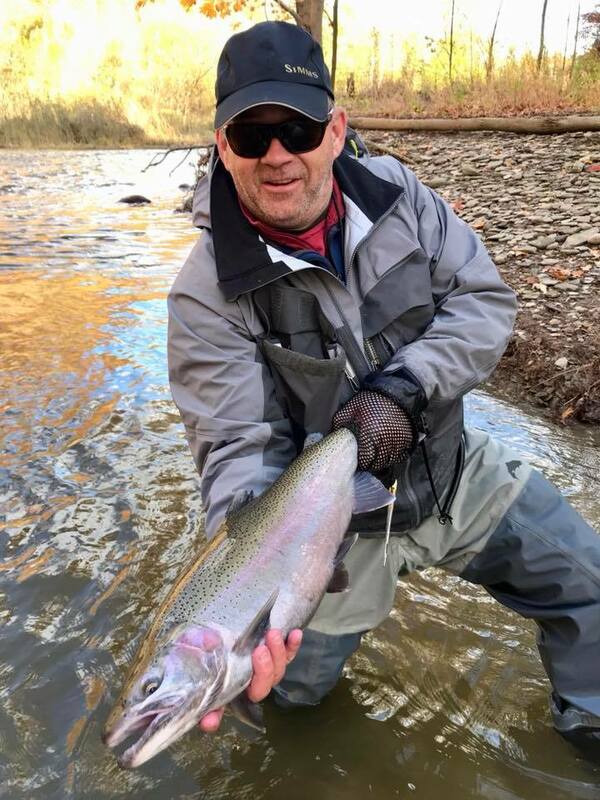 Shawn started fishing forty years ago and started fly fishing at age 24, shortly before attending college in Montana on a bird hunting and trout fishing scholarship. Since then Shawn has fished extensively all over North & Central America, as well as the Caribbean. 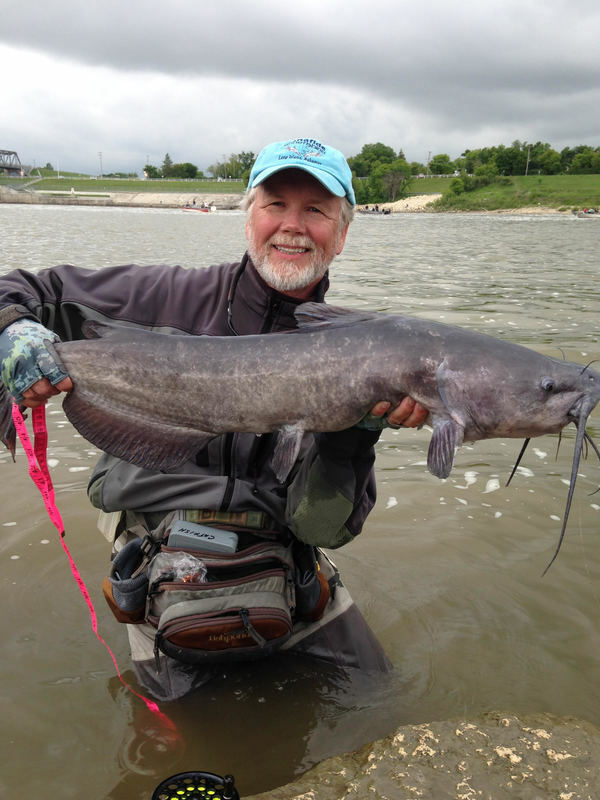 He has a life list of 57 species caught on fly and is an IGFA (Tippet Class) world record holder. He is the former president of the Saltwater Fly Anglers of Delaware based in Lewes, DE. Shawn has been tying his own flies for over a decade. He prefers tying for and targeting new species to add to his life list. Shawn volunteers for Project Healing Waters Fly Fishing and along with the SFAoD makes it his mission to share the joys of fly fishing with as many people as he can. ​As early as Eric can remember, he has always loved fishing. Growing up in rural Maryland, north of Baltimore, provided numerous opportunities to fish for trout. Eric and his father would also fish the local ponds and reservoirs for bass, sunfish and crappie. When Eric was about 15, a fly shop opened in his home town of Hereford, MD. On The Fly was just 3 doors down from his house. The Owner, Wally Vait, took Eric under his wing and taught him to tie flies. The shop was just steps from the Gunpowder and primarily focused on trout fishing. As happens with many teens, Eric’s attentions turned to other interests. Fifteen years later, Eric found his way back to fly fishing and tying. Though he started chasing wild browns and brookies on Maryland’s trout streams, thoughts eventually turned to his first love, warm water! Eric’s varied fishing background became the basis for his tying style. He developed many original patterns for Largemouth and Smallmouth Bass, Sunfish and Carp; along with some really sweet terrestrial flies that can be fished for multiple species! Eric’s patterns have been fished and refined over many seasons. They have caught fish in many parts of the country and in varied water types and conditions. Ethan has been fly fishing for several years, tying flies for most of that time. 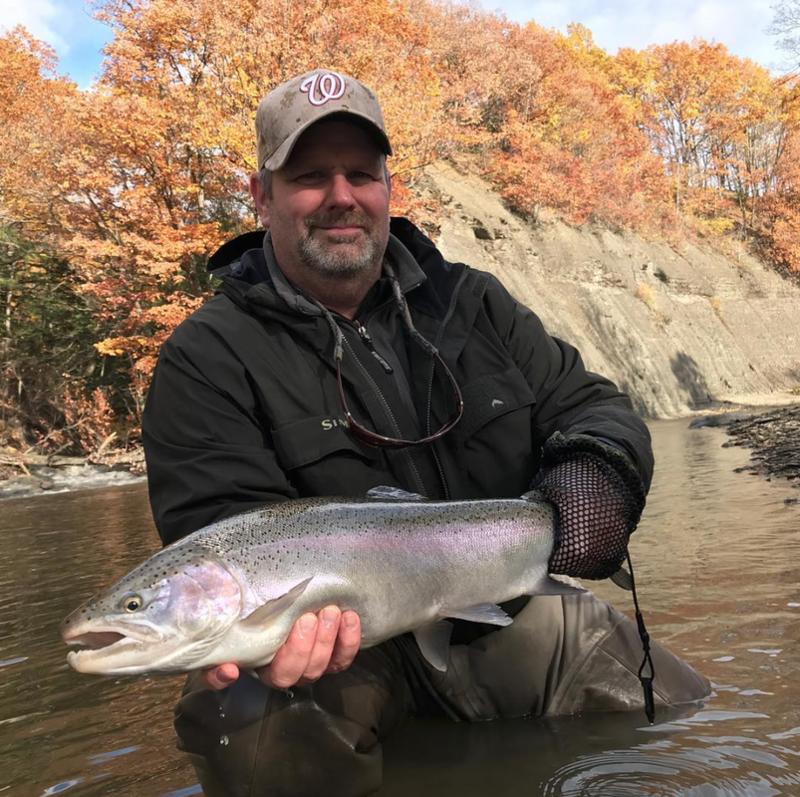 Pursuing his passion of fly fishing has allowed him to fish destinations from Pulaski, NY chasing salmon, to Bermuda and Puerto Rico pursuing snook and tarpon, and a multitude of places in between. He's caught many different species on fly, ranging from Bluegills to 25 pound Atlantic Salmon. Though he has only been tying a short time, Ethan has tied at multiple shows as well as being extremely active in his local fly fishing club, helping to represent norvise. Braden is 12 years old (our youngest team member) and has been tying flies almost 4 years now. He taught himself by watching videos on YouTube and Instagram. After attending the Virginia Fly Fishing Festival in January 2018, he did a live Instagram story with O’Neill’s Fly Fishing while tying on a Norvise for his first time. He was recorded on his first podcast, and participated in a video interview/story with Temple Fork Outfitters. 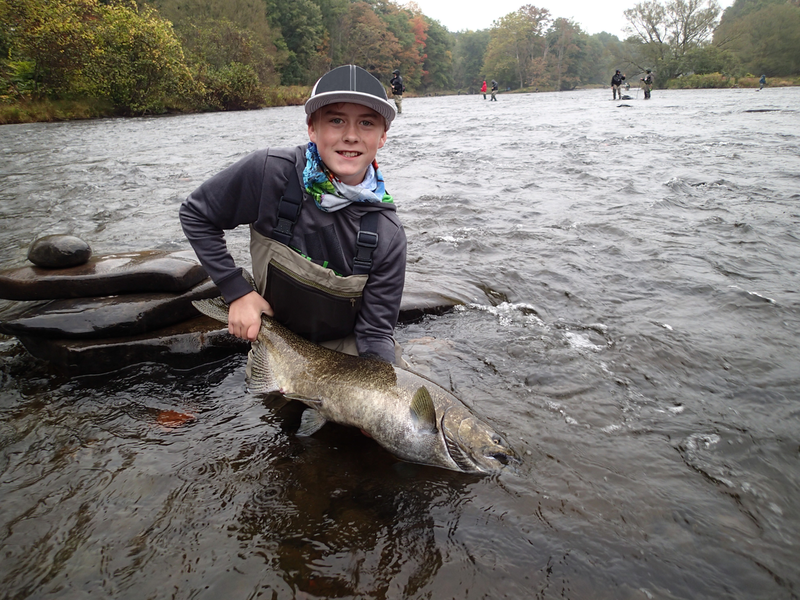 At the Edison, NJ Fly Fishing Show, Braden was asked to join Team Norvise and he received his very own Norvise. Since beginning to tie on his norvise in late January, he has tied at numerous club functions and local events in the Virginia/DC area. While attending the Lancaster, PA Fly Fishing Show he received some very exciting news, Temple Fork Outfitters made Braden their first Jr. Pro-Staff member ever! Braden is also a partner with Project Healing Waters. I’m a bit of a gypsy at heart who has recently married and settled down on the Coast of Maine. I grew up on the East Coast and spent most of my young adult years in the White Mountains of NH where I’ve guided for trout and moved my guide business to the Midwest to guide for musky in the UP of Michigan. I'm a contributing Editor for Dun Magazine , Pro Tier for J. Stockard and pro staff for TFO Rods, 12wt, Nor Vise , Semperfli , and Pike Skinz. 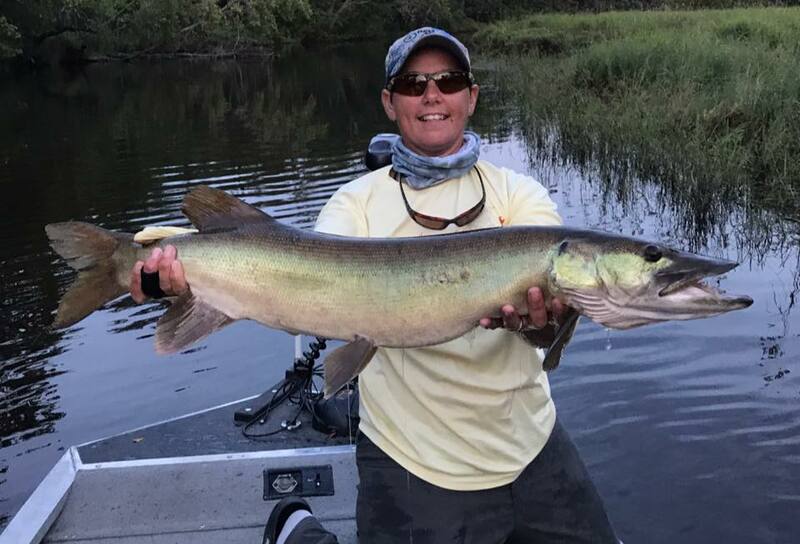 As a past musky guide, many of my clients were new to the toothy critter game so I designed flies that were easy to cast and would shed most of their water weight on the first back cast keeping my clients in the zone all day long. If you are looking to get into the toothy game and don't want to cast a wool sock, ya don't have to! My "Quick Shedding" flies will put you in the zone without torturing yourself! My other job is being a garden coach/ horticulturist for individuals and organizations. I’m a contributing editor for the internationally acclaimed Dun Magazine, a women’s fly fishing magazine. My current focus is to build up a predator fly tying company that makes flies for apex predators that exist in eco systems everywhere. Mike has always been addicted to fishing since growing up in Northern Ontario. He is a self taught fly tier, learning from a book by Bill Blades in 1970. (Eventually he acquired a signed version of the book!). Fly fishing and tying have been his passion since the early '90's. Starting in 2001, He spent 10 summers guiding Trout anglers in Western Canada, while taking sabbaticals from a full time job as a Geophysicist. In 1995 Mike started tying flies commercially. His annual TU fly box donations were much sought after. Like most fly anglers wanderlust seems inevitable, taking Mike to many locations in Canada, the U.S., Bahamas, Belize, Mexico, Austria, Portugal, Slovakia and his favorite, New Zealand (5 trips). In 2017 he managed to coax 30 different species (20 Freshwater and 10 Saltwater) to hand; Mike normally spends 120-150 days on the water. Every year he seeks new species on the fly, adding Shark, Channel Catfish, Freshwater Drum, and Musky to the list this past year. During his many tying demos over the years a constant comment is "You make it look so easy." Mike's response is always, it's the Norvise! 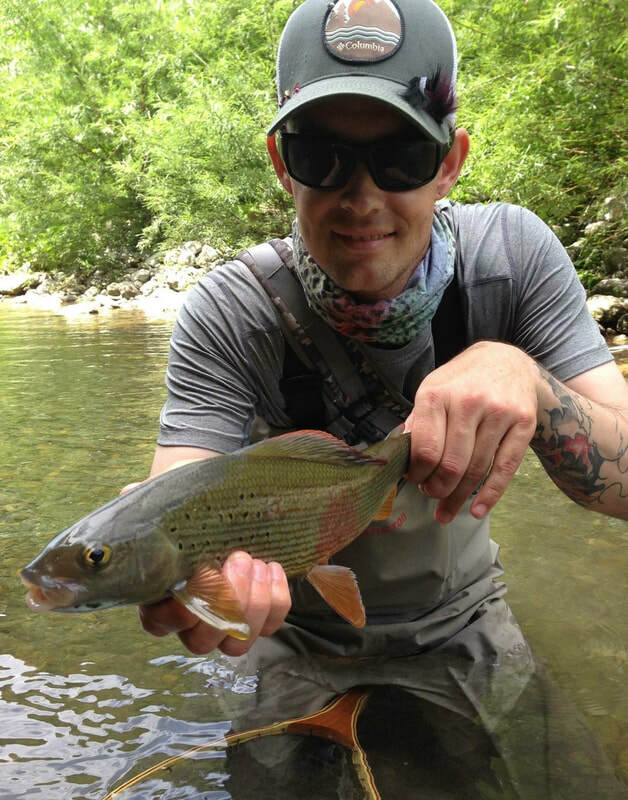 Originally from Bridgeport, West Virginia Jacob was introduced to fly fishing and fly tying at the age of 13. After graduating college from WVU, Jacob became what some might call a “streamer junkie.” The high cost of large, articulated streamers on a college budget led him into his passion for tying flies that are targeted for multiple species. When Jacob is not behind the vise, he is often fly fishing from his kayak or wading through rivers trying new fly patterns, often times for new species. He and fellow fly angler Grant Alvis co-founded the fly tying community known as RVA Bugs and Brews. Jacob is passionate about connecting with other fly fisherman and fly tiers as he feels relationships are a foundation to a great fishing experience. His favorite fly to tie is Russ Maddin’s, “Circus Peanut” and his favorite to cast and swim is Blane Chocklett’s, “Gamechanger.” Jacob is the Social Media Chairman of the historical Virginia Angler’s Club of which Joe Brooks was a founding member. Jacob is very active on his personal Instagram page where he shares his most recent ties and catches. Kevin was born and raised in Georgia and started fishing over 43 years ago. 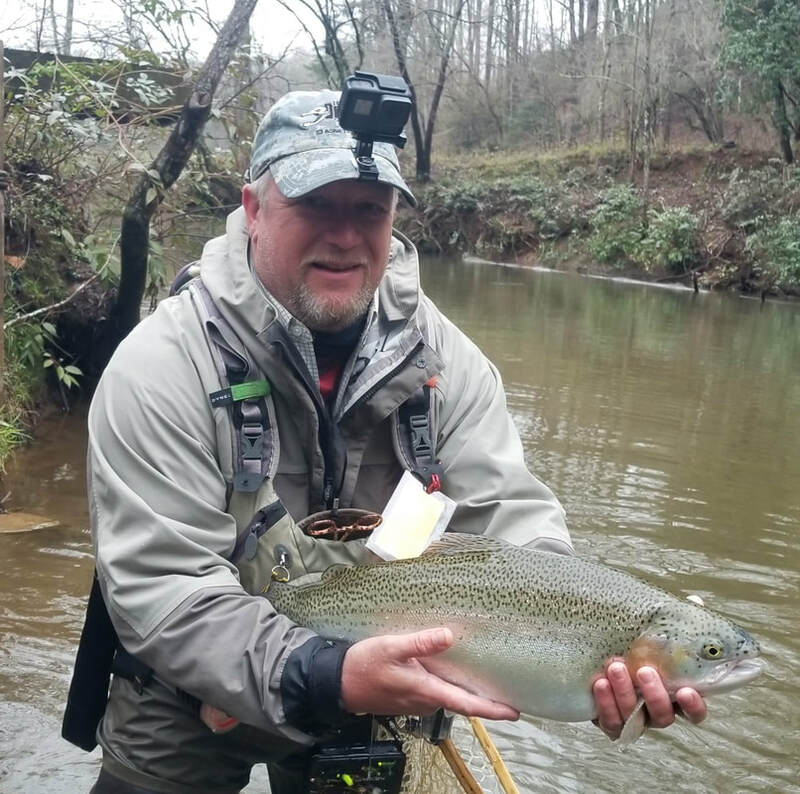 He is a competitive angler, a Toccoa river guide for BigT Fly Fishing (www.bigtflyfishing.com), a European nymphing instructor and has been featured in Orvis News. One thing that Kevin is as passionate about tying as he is fishing. He started fly tying over 10 years ago and really enjoys his time at the vise. He is a contracted fly designer for Orvis and has been tying exclusively on a Norvise for over 8 years and swears he will never tie on anything else! He ties at numerous Fly Fishing events throughout the year and enjoys paying it forward and passing the art form on to others. Checkout Kevin's Instagram account to see some of his work. I grew up Bass fishing on farm ponds in Sullivan County Pa. In 2007, my brother in law introduced me to fly fishing, it was a struggle to get going. Once I finally caught my first trout on my home waters of Lehigh County - I was hooked. From that point on my interest, knowledge and participation grew. In March of 2016 I hooked up with Temple Fork Outfitter’s and became on their Pro Staff and eventually moved up to an Ambassador. I am also an Ambassador for Wingo Belts, Yeti and Compass 360, Team Norvise, RiverBum and Columbia . Along with that I am the Sales Rep for Rock Treads and Brook Fishing Equipment. I am honored to represent all of these amazing brands. However, most important I am a husband and father to my wife Ginna and my two amazing boys Dylan and Logan. Who support all I do, without them I’d be lost. ​I started fishing for trout when I was about four years old in the stream at the bottom of our garden. When I was 12 my parents immigrated to Lanzarote. There I went to a Spanish school. Upon leaving I got my first job on a big game fishing boat, where we caught Marlin, Tuna and other big game species. Since moving back to England in my late teens I learnt to fly fish and tied some fairly crude flies. Over the years I have improved a little! Approximately 10 years ago I was left disabled after an accident and fly tying became my main hobby, after watching Norm with his YouTube video’s I bought my first Norvise. Then I joined the Flydressers guild (FDG) and we started our local fly tying group of which about a dozen of the members have Norvises. I am a gold grade instructor with the FDG and that for me is all thanks to Norvise. Hello, my name is Thomas Lamphere. I am a fly fishing and fly-tying fanatic. My Father Rueben got me started when I was 6 years old, and I never seemed to put the rod down. At night I was tying flies all the time with my father. By the time I was 15 I was selling flies to my teachers and other fisherman that I knew. Going to Peninsula High School I was also across the street from my favorite beach on Puget Sound. I would fish every day after school chasing Sea-run Cutthroat and salmon. When I graduated high school, I went right into commercial fly tying. I was tying for several fly shops and still do to this day. At the Age of 22 I started working for a company name Fish Hunter ENT. It was owned by Jack Moore at the time who became a good friend over the years. This is also when I met Norm Norlander, who also became a friend who I greatly enjoyed having conversations with over the phone. 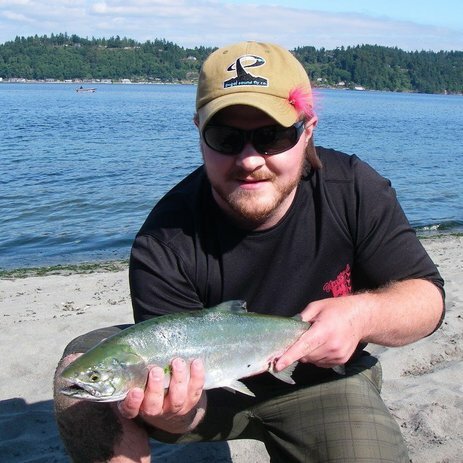 Over the years working at Fish Hunter I learned a great deal about the industry and started teaching weekly fly-tying classes with The Puget Sound Fly Fisher’s Club in Tacoma, WA. The weekly tying night have become such a part of me that it followed me to Idaho. In March of 2018 Fish Hunter ENT was purchased by Nature’s Spirit, where I am now the manager and reside in Kamiah, ID. As for fishing I have targeted every species in the Northwest that I can chase with a fly rod. Sea-run Cutthroat being my favorite along the shorelines of Puget Sound. Along with salmon in the summer and fall, and steelhead in the winter. Add in a tuna trip in the summer and life was great as a fisherman. Being a lover of steelhead as well my decision to move was rather simple with not living on the Clearwater River. Though I will say to its credit the smallmouth fishing has been spectacular. When it comes to fly tying, it is by far my favorite thing to do. I tie almost every night either filling orders, filling my boxes, or just playing with new patterns and materials. I have Three patterns with Solitude and sell many custom patterns on my own. I do that through my own business Lamphere Fly Fishing. There is nothing that I have not tried to tie, from trout flies to bass, pike, tarpon, steelhead, bonefish, and even flies for the amazon. My goal with fly tying is to learn and share as much as I can in the life time that I have. ​Born and raised in Reno, Nevada Thomas grew up fishing infamous waters like the Truckee River, and Pyramid Lake on the hunt for big Rainbow, Lahontan Cutthroat and Brown Trout. At the age of 21 he enlisted in the United States Army as an aircraft electrician. The opportunity to travel allowed him to diversify his fishing options and he soon found himself spey casting to wild Salmon and Steelhead on the Olympic Peninsula. From there his passion and what most would call an obsession took hold of him. 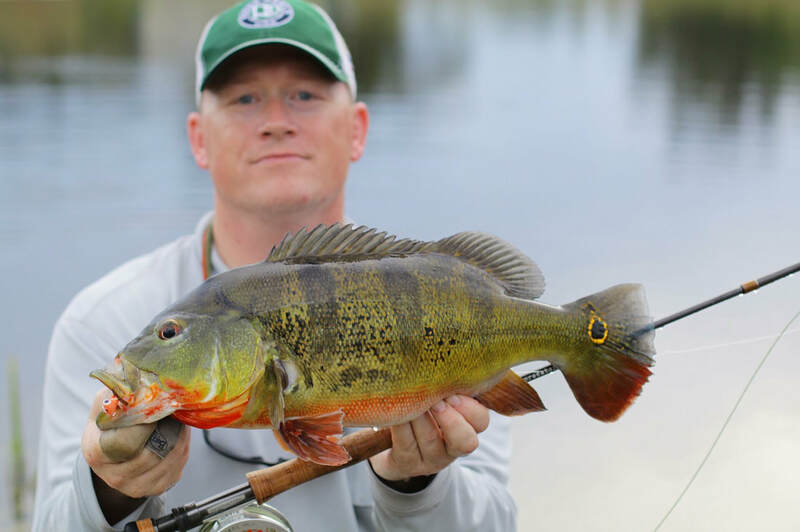 After multiple combat tours to Iraq and Afghanistan left him struggling he found himself more and more immersed in fly fishing and he wandered deeper and deeper off the beaten path in the pursuit of what he loved. His absolute favorite place to fish is outside the village of Kobarid, Slovenia. There in the River Soca, monstrous Marble Trout are king and years of experience are put to the ultimate test. He spent his summer walking the white sand and limestone streams chasing Marbles and Grayling. Often he found himself crawling on his stomach to approach weary fish with only a cast or two if he’s lucky to get it right. After a decade of honing his skills he opened Stoneys Custom Flies in 2018. Fly fishing has forever changed his life and given him a peace that is hard to justify in words. Today serving on active duty he spends his days training Soldiers and his nights tying flies, growing his company and dreaming of his next adventure. Throughout my career as an educator (spanning more than 45 years), as a Teacher, Principal, Assistant Superintendent, and Professor of Education at Warner Pacific College my love for teaching has continually grown. My passion for teaching and learning has only grown more with time. Through all these years I have learned many lessons, one of which is that learning must be relevant and fun. I find teaching fly fishing, fly casting, and fly tying a great opportunity to give back, and share my passion, on what I have learned. I love to see people get excited about learning. It is exciting to see people tie their first fly, cast their first cast or catch the first fish on a fly...The joy of learning is a powerful motivator. I began fly-fishing at a young age. My father, (my best friend), purchased a JC Higgins fly rod outfit for me. The purchase of that outfit began a life-long love affair with fly-fishing. I got my start in the fly fishing industry in 1983 at Stewart’s Custom Tackle. At that time, I taught fly tying classes from beginning to advanced. I instructed fly fishing seminars. In those seminars I did in-store demonstrations on knot tying, entomology, reading streams. I co-taught with Doug Stewart the on-the-river portion which covered instruction on casting and general fly fishing techniques. I am a fly fishing instructor. I present to clubs throughout the Pacific Northwest and teach a fly fishing school in Montana. I was a co-founder and, was the Director of the Northwest Christian Fly Fly fishing Inc. Our organization has since 1995 put on a fly fishing camp. .